Payroll Mate® makes processing dentistry payroll easy and affordable. With our system you can pay dentists, office managers, dental hygienists, receptionists and other the employees within a dentistry. The Software is installed locally and can handle different types of payroll incomes, taxes and deductions. Free trial download is available along with free technical support before and after purchase. For $119 only, process payroll for up to 10 dental practices with up to 75 employees per practice for one calendar year. Operating a dental practice can be a lucrative endeavor, but to be successful, you must ensure that you provide quality services and employ the best staff possible. Part of retaining quality staff is ensuring they are paid on time and that all relevant federal and state payroll requirements are met. While the payroll process can be a challenge for any dental practice, Payroll Mate® has been designed to make that process easier, faster, and more streamlined, all while giving you the benefit of greater accuracy. Payroll Mate® provides a full suite of features that will work well for any dental practice searching for a more effective way to process payroll. 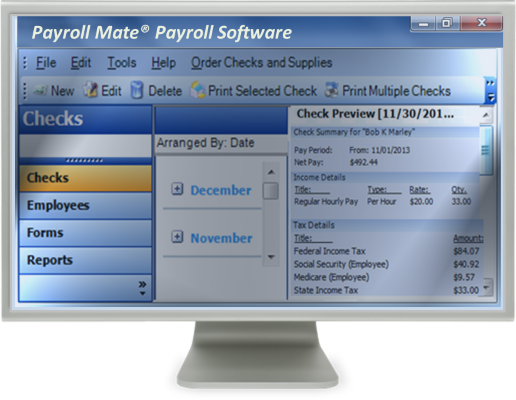 • Payroll Mate® automatically calculates State and Federal withholdings, Social Security, Medicare, and net pay. • At the same time, your dental practice may be subject to other taxes besides the ones listed above. This software allows you to easily customize your tax categories by giving you the option to custom create any sort of tax you may need. You can also custom create income categories and deduction categories if needed. • Along with calculating Federal and State payroll taxes automatically, this software also supports a variety of different pay frequencies and pay types. Pay frequencies include daily, weekly, bi-weekly, semi-monthly, and monthly. • These features ensure that you are always in compliance with state and federal requirements. • You can take advantage of comprehensive payroll reports such as Employee Earnings, Taxes and Deductions, Payroll Journal Detail, Tax Liability, Deposit Requirement, State Taxes, and many others. • Payroll Mate® supports a number of Federal forms including: W-2, W-3, 940, 941, 943, and 944. • Does your dental practice process payroll using traditional payroll checks or with direct deposit? Either way, you are covered with Payroll Mate®. Once payroll is calculated, this software can produce signature-ready checks and detailed pay stubs that can then be provided to employees. If you prefer to use direct deposit, you can purchase an additional cost add-on feature to Payroll Mate®. An increasing number of employees are now requesting this option, as it is more convenient and reduces the chances of fraud. If employees in your dental practice have been requesting direct deposit rather than a paper paycheck and you have been hesitant, Payroll Mate® can help you implement direct deposit with ease. • With this payroll software solution, you can ensure that vacation or sick time is accurately tracked. This information can even be printed directly on payroll check stubs. • One of the most common reasons why many dental practices are hesitant to incorporate a new payroll system is because they are concerned that it will take too long to learn how to use this system. Payroll Mate® is designed to be intuitively easy to use. • With a step-by-step wizard that walks you through the process, your payroll staff will be able to use this software in virtually no time. • Built in tutorials are also included in the program which provide you with detailed instructions on many features of the software. • If you are needing additional support, customer service is conveniently available by phone, email, or live chat. • Payroll Mate® allows you to easily install updates throughout the tax year so you can ensure you always have the most recent tax tables or changes to tax forms. Operating a dental practice can include a number of significant challenges, including the need to stay on top of the latest dental health industry updates while simultaneously providing the best possible care to patients. Payroll Mate® can help you with processing payroll in a timely manner so you can focus on other responsibilities that come with running your own dental practice.